As we’ve been on holiday since May, the summer months have enabled Seed for Change to come back stronger in this new phase. The first to return was María, she went to Varanasi in July. During which time, she welcomed the eight girls that participated to the 1st Solidarity Trip that Seed for Change organises together with the social Open Eyes Project. 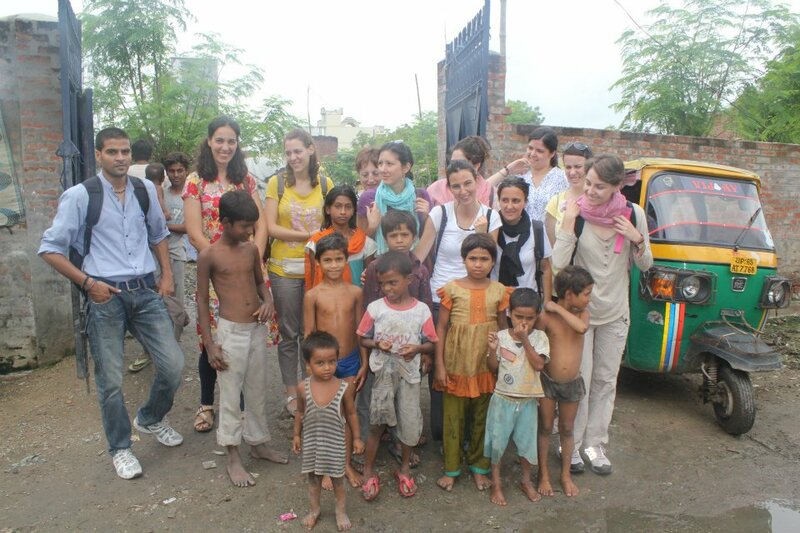 The group of the 1st Solidarity Trip with María and Virat in the Sigra slums. As well as visiting Agra, Jaipur, Delhi and Varanasi, we gave them a course on the introduction to International Cooperation and they studied closely all of our projects: our Marina Silk scarf workshop, the sanitary and education project in the slums of Sigra and in our Dashashwamedh headquarters. And of course, there was still plenty of time to talk, play, carry out activities with the children and put into practice the theory that they’d learned. Since the beginning of September, we have been welcoming our new volunteers: Cristina, Laura, Pere and myself (Belén). We arrived with the same illusion and strength than last year’s volunteers we said goodbye to: Sheila, Naiara, Cesc and Jordi. We will be introducing ourselves through this blog. The first trip with the children of Sigra was done in September in the sacred town of Sarnath, only 12 kilometres from Varanasi. From dawn onwards, the children were extremely happy to enjoy a day out of the centre, except from the heat and humidity but even then, you could still see how happy they were. The children in the Sarnath buddhist temple. The 73 children visited Mulangandha Vihara Kuti, a city famous for its Buddhist temple and zoological park. They didn’t stop running around, jumping, playing, going on the swings and the carousel horses. The adults also enjoyed the day as they saw how the children couldn’t stop smiling. Besides from Laura and Pere, the two volunteers who’d recently arrived from Spain, four members of the second edition of the Solidarity Trip accompanied us, as well as a recently married coupled and sponsors of three of our children who were on their honeymoon in India, which we of course did not hesitate to invite along. Before returning to Varanasi, we had the time to eat an ice cream and blow balloons in the shape of animals, which more than one of us used as an improvised hat. The balloon made hats which didn’t go amiss during the trip. We already have 107 children in school! We have a lot to tell you and we do not want to forget about August which was a month filled with good news. Thanks to the sponsored campaign we created in Facebook and the travellers who visited us during the summer, Seed for Change has obtained 15 new sponsors and we already have 107 children in school. From our centre in Sigra, 13 children have joined the R.S. Montessory School, which add up to the 72 students that had already joined the school year. Two more children out of the 33 students that passed through our classrooms have now joined the Learning Point School. We feel very proud of these 15 newly sponsored children, most of which have been attending preliminary classes in our facilities. To conclude the first post of this phase, we would like to leave you with this last photograph of Pere and Putul, the cook of the Dashaswamedh centre, who taught us how to cook various traditional dishes: Chapatti and Yaloo Paratha – a feast that we still talk about. We had a lot of fun as Putul’s kitchen assistants for the day and we learnt to knead - it’s actually not that simple! It was a lovely way to introduce us to the world of the incredibly varied Hindu kitchen and to what will be our new life with Semilla.